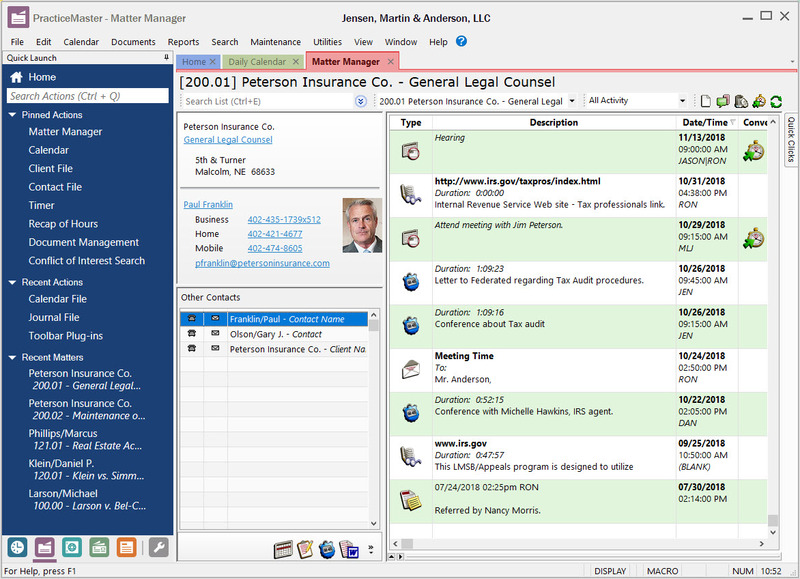 PracticeMaster does more for lawyers than Outlook can. 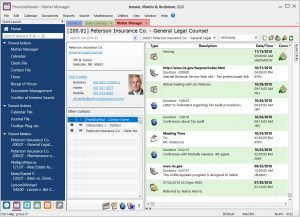 Outlook can organize your email, your contacts and your calendar, but it can’t organize a legal matter, much less multiple legal matters for the same client. See how Outlook is different than practice management software. 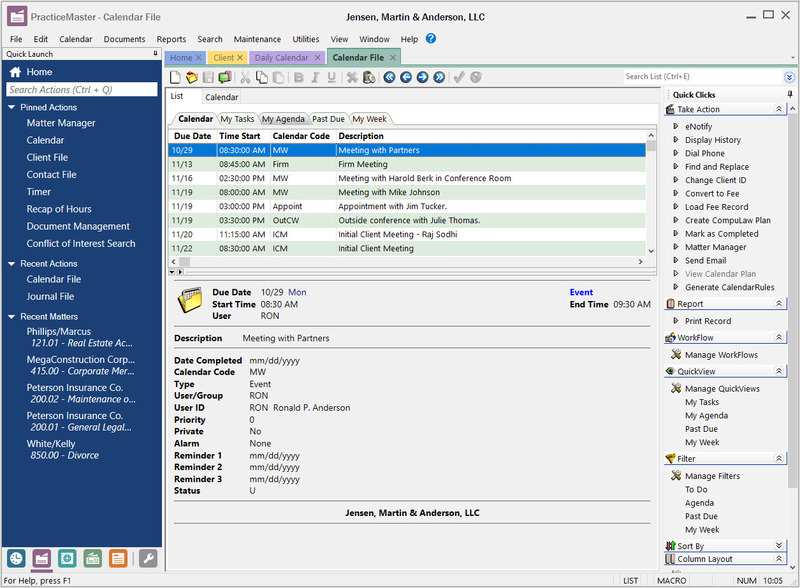 The Matter Manager organizes your matter information. 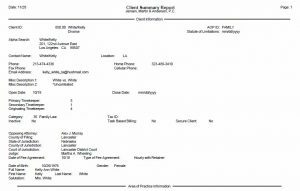 At a glance see your client’s contact information for quick reference and all activity for your matter: emails, documents, fees, appointments, costs, research notes, and phone records. If any of the activity has not been converted to a fee for billing, you’ll see a simple icon that you can click to do so. You can view a billing summary for the matter to quickly see what’s been billed, paid, and the balance of the client’s trust account. You can also see information related to the specific area of practice. It’s all of your important information, organized and easy to find. The PracticeMaster calendar can be synchronized with Microsoft Outlook®, with or without using Exchange®. View appointments for everyone in your office with a firm-wide calendar, or view just the appointments and tasks for a specific matter or client. Find appointments fast by color-coding them by staff member or type of activity. 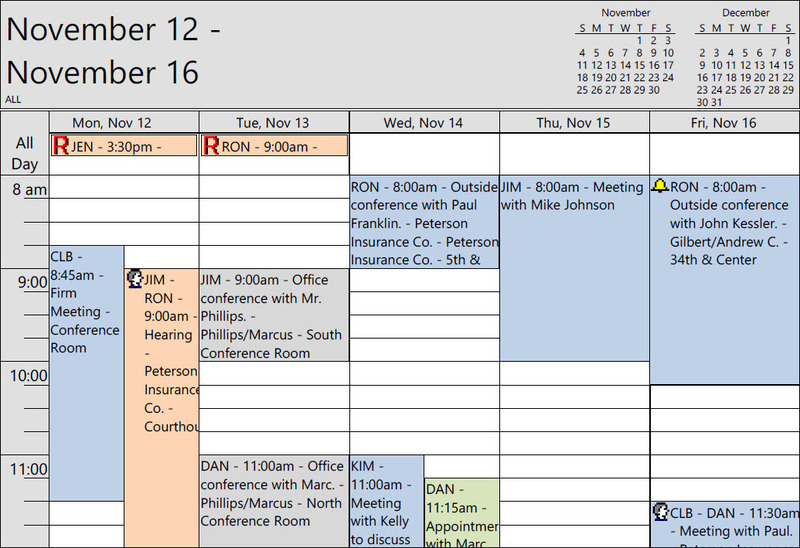 Schedule appointments for one person, groups, or for everyone in your firm. You can also schedule recurring appointments that do or do not follow a regular pattern of time (e.g., every three weeks on Wednesday, every 14 days, etc.). After you add something to the calendar, PracticeMaster checks for conflicting events already scheduled so that no one is scheduled for more than one appointment at a time. Define your own holiday schedules. Use federal, state, county or even jurisdiction specific criteria when creating reminders and due dates. 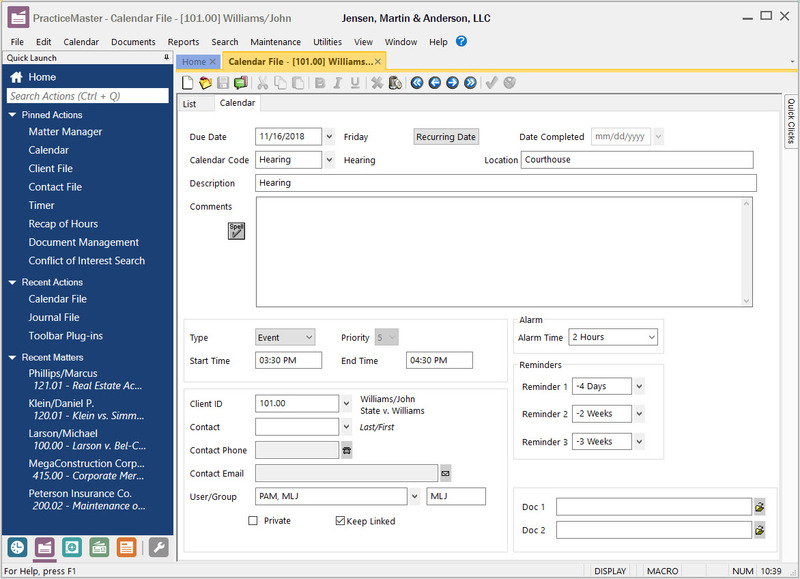 Customizable security settings control which employees see appointments for certain attorneys and/or clients. Optional reminders and alarms make sure you never miss a meeting or forget to do something important. Instantly see possible conflicts of interest between anyone in your firm and a potential client. 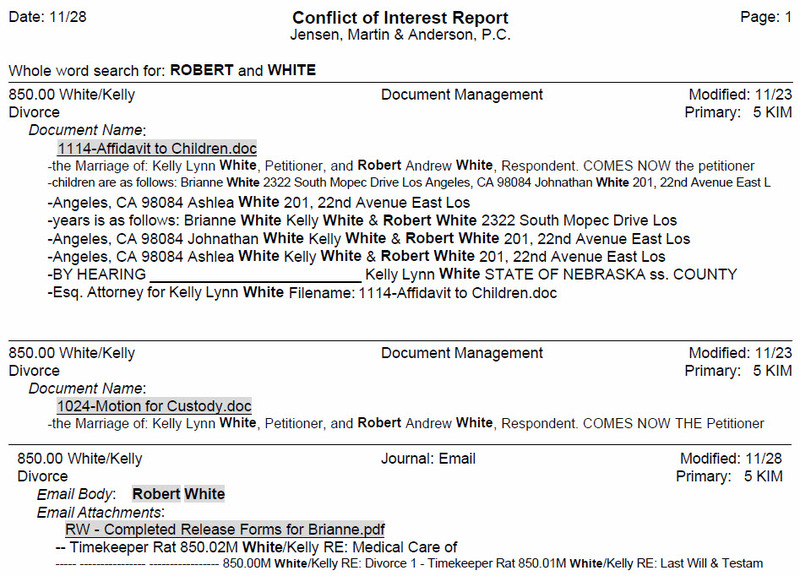 When you preview the conflict of interest report, click on any record to open a new window containing all of the details of this specific conflict. Search all files including your documents, emails, and attachments. Search options for conflict checks include “match partial words,” “starts with,” “phonetic check,” and “contains,” which result in fast, flexible, and accurate searches. Make your search even more specific using phrase matching, such as “must match at least one word” and “must match all words.” Learn the Top 5 Tips for Conflict of Interest Checking. 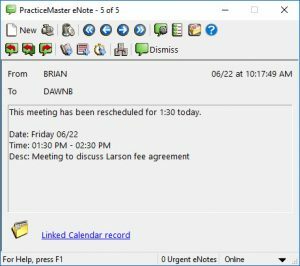 Integrate with Outlook and easily bill for the time you spend on emails, and add emails to your client’s file in PracticeMaster as you read and send them. PracticeMaster suggests where to file the email based on the email address. 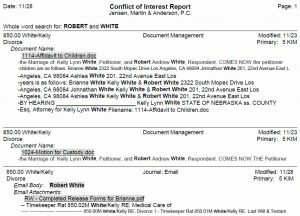 Once your emails are in PracticeMaster, they are included in conflict of interest searches (including the attachments) and automatically organized by client and matter, making them easy to find. You can also automatically add attachments to PracticeMaster’s document management system when you add an email to PracticeMaster. PracticeMaster has timers to track the time you spend on phone calls, research, and more. Right-click on an appointment in your calendar to bill for that time. When you integrate with Outlook, it’s even easier. Add a fee every time you send an email, or with the click of a button, track the time you spend reading email in your inbox. Set minimum time increments for different types of entries to make it even easier to bill for emails, phone calls, internet research, etc. PracticeMaster allows you to link any document to any client or matter so that you can find it easily. Built-in document history tracking lets you track when changes were made to a document and who made them. You can easily import scanned documents to PracticeMaster by using PaperPort® imaging software, helping to make the scanned image easy to find. PracticeMaster plugins allow you to save documents from Word, Excel®, or Adobe® Acrobat/Reader as Document Management records. Learn about how Windows Explorer is not document management. Use WorkFlows to automatically start tasks, or give you and your staff reminders after you perform a particular action. For example, when you add a new client, let PracticeMaster automatically generate a thank-you letter. 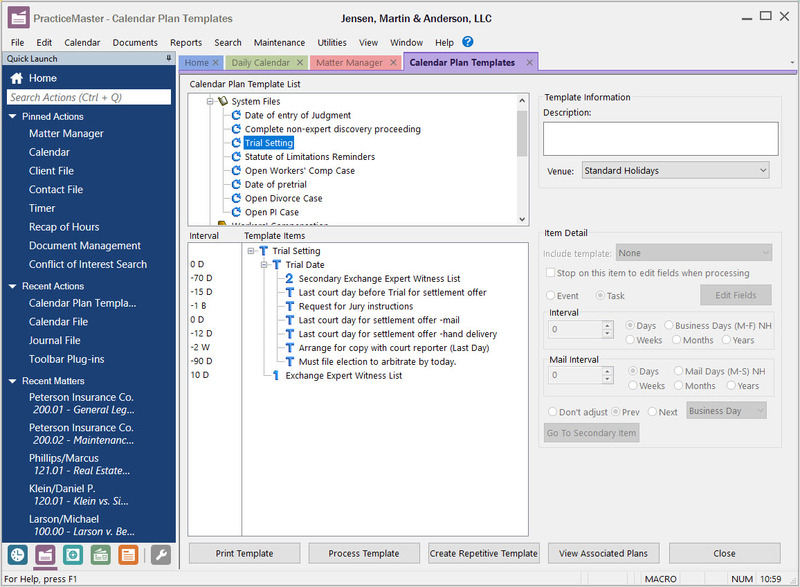 Include up to 10 actions in any WorkFlow. Actions include starting emails, adding appointments, assembling documents, displaying messages, running reports, launching other PracticeMaster features, or launching other software programs. When you automate frequent or complicated tasks with WorkFlows you will see fewer errors, you can train new staff members more quickly, and you will be more productive. PracticeMaster comes with several reports that will give you insight into the details of your clients, appointments, to-do lists, and pending assignments. 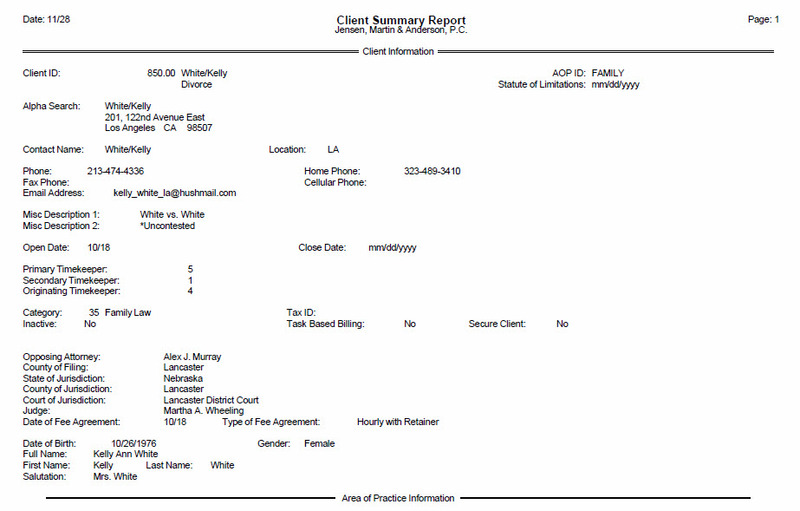 (For example, calendar reports, client reports, and task lists.) 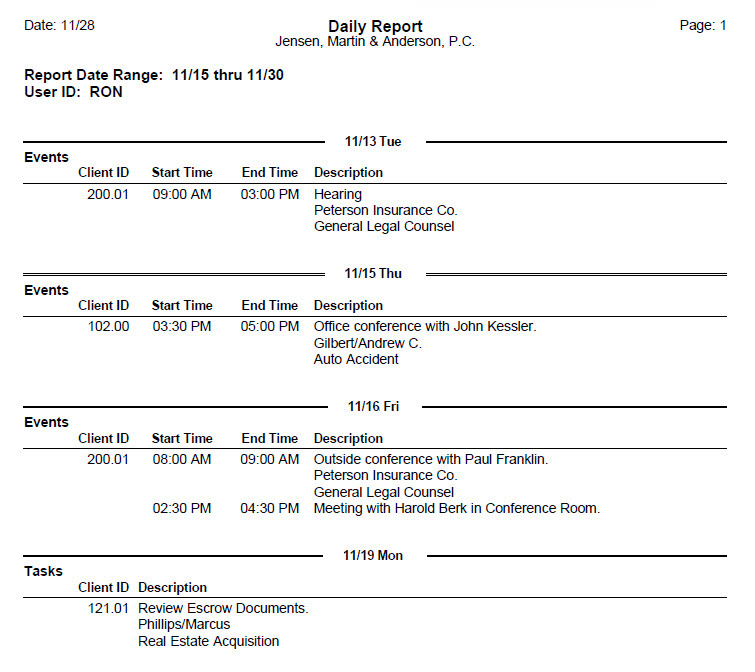 You can also use PracticeMaster’s Report Writer to create custom reports using any existing and/or user-defined fields. Reduce paper clutter in your office by saving reports as PDF, HTML, Excel (.xls or .xlsx), or as text files. 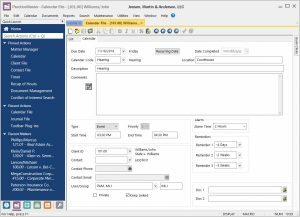 Restrict the ability of any user to view, enter, edit, or delete information from any client, matter, or calendar. Use access profiles to make sure that sensitive information remains secure. Editing access can even be done for specific fields. Use information you have already entered into PracticeMaster to fill in the blanks for common documents, using PracticeMaster Document Assembly (Microsoft® Word required). You quickly end up with a great first draft to review. PracticeMaster Document Assembly can automatically bill for any document. PracticeMaster also integrates with HotDocs ®. Use Calendar Plan Templates to schedule a series of events based off of one or more key dates. 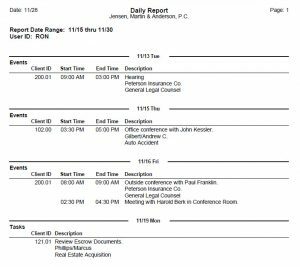 Use your Calendar Plan Templates again and again for court rules, opening a new matter file, collection follow-up, etc. Different types of matters require different types of information. For example, you would collect different client information for a family law matter than you would an intellectual property matter. Area of Practice Templates let you change the client entry pages based on matter type, so that all data fields are relevant to the matter. Examples of Areas of Practice are Family Law, Personal Injury, Medical Malpractice, Wills & Trusts, Business Law, Consumer Law, Criminal Law, Real Estate, Patent Law, Immigration, etc. Back up your data while people keep working. Protect your data from damage caused by unforeseen power outages or lost network connections. Get reports, filtering, and sorting 10 to 30 times faster. If you have a large data set, lots of users, or a congested network, you will notice significant results. Give all users a chance to save their work and exit before they are logged off automatically. Use Log Off User when it’s time to do maintenance work, such as installing software updates. 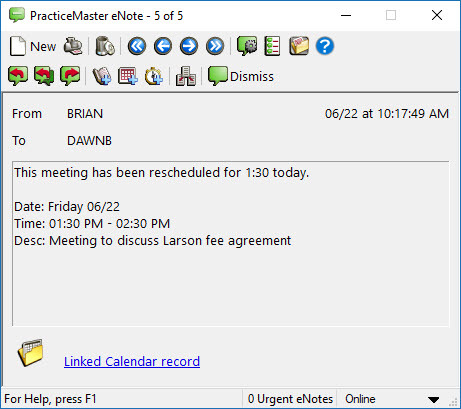 eNote is intra-office messaging in PracticeMaster. Sometimes you cannot wait for someone to find your email in an overflowing inbox. Other times you need to tell someone something while on the phone. When you receive an eNote, it pops up on your screen. You can easily reply, forward, or dismiss it. If you don’t want to be bothered, you can set your status to “Do Not Disturb,” so your eNotes can be read later. You can also use eNote to send co-workers links to appointments or any other record for quick reference. In addition to all of the Platinum features, you can use 64-bit server capabilities for faster data queries in external programs such as Microsoft Access ® and Excel ® with Platinum SQL.